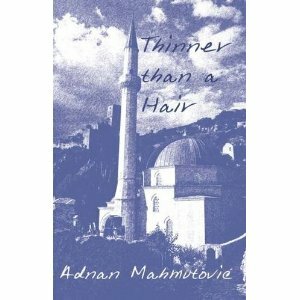 A few weeks ago I had the pleasure of reading Adnan Mahmutović's novella 'Thinner than a Hair'. It is an extraordinary book describing the experiences of a young woman coming of age during the conflict in the Balkans. The community disintegrates, and as it does so the people are bewildered. Neighbours turn against neighbours, and people are forced to choose between exile or death. Adnan Mahmutović evokes not only this alien culture, but also the way such trauma affects relationships. English is Adnan's third language and so he uses it in a slightly unusual way. This adds to the effectiveness of the prose and the reader's sense of being on the outside looking in. The book is well-paced and highly satisfying, as well as an excellent page-turner. Adnan has kindly answered a few questions about his writing and his life in exile. 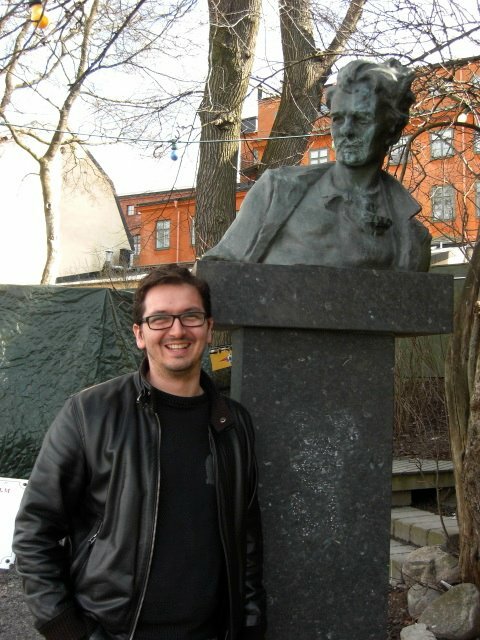 Adnan Mahmutović, born in 1974. is a Bosnian Swede, an exile who teaches literature at Stockholm University in daytime, and occasionally works with people with various different disorders at night. Adnan left Bosnia and settled in Sweden in 1993. After a few years in a small South-Eastern town, he relocated to Stockholm to work as a personal special-needs assistant. This employment of thirteen years financed his further studies in English literature and philosophy. In May 2010 he was awarded his PhD in English literature. He has published a collection of short stories and poetry, [Refuge]e, and two novellas, Illegitimate and Thinner than a Hair. Find his author's website at adnanmahmutovic.com. CD: English is your third language, but your grasp is hugely impressive. Please tell me a little about your 'language history' i.e. which languages you have learnt and when. AM: Thank you. It’s a great compliment. I’ve worked hard to come to point where I could not just write straight prose but also experiment a little with the language. It’s funny to remember how I struggled with German some two decades ago. I guess I didn’t see a point in learning a language I didn’t think I’d use. Once I became a refugee in Sweden in the 90s, it took another year and a half before I left the refugee camp and started taking classes in Swedish as Second Language. I was 18 then. It was quite easy. Swedish grammar was a walk in the park compared to Bosnian. Then, one day, a tourist asked me for directions in English and I couldn’t tell him. I was really ashamed of myself. I didn’t even know the basics. Then I swamped myself with books and tapes I found in the local library. I took course after course after course until I could apply for a university language programme. I ended up in the English Department. I was twenty-four then. Four years later I started on my Ph.D.
CD: The narrator's voice is convincing. Why did you decide to write from the point of view of a girl? AM: I grew up in the company of women, all kinds of personalities. Even today most my friends are women. Maybe at some point I imagined I was one. Just kidding. The thing is, during the war, I saw that women both suffered greatly, but also proved incredibly strong, providing for their families in so many weird ways. Women weren’t expected to don uniforms and use guns, but for that their struggles were much more versatile. I wanted to explore that. CD: Do you only write in English or do you write in other languages too? AM: I did write a few columns in Swedish, long time ago, but that’s it. Almost always English. CD: Please tell me a little about how you came to win the Cinnamon novel competition. AM: A good friend of mine, Kat Magendie, the editor of The Rose and Thorn Journal and a great writer herself, accepted a story of mine and nominated it to all kinds of awards in the US. I showed her Thinner and she ensured me I had a great story. I started submitting, but kept getting rejections. Only later did I realize I was targeting the wrong publishers. I was picked up by a scouting agency Cornerstones, but their agents thought my book wasn’t commercial enough. I heard that one of them signed an author who was shortlisted in a competition run by Cinnamon Press and I wanted to try. There were some 400 entries, I think. It was stunning to hear that I won. CD: Is the history of Fatima similar to your own? AM: No, not really. Maybe some small things, some few things happened to close relatives of mine, for instance my uncle and his family shared a room with a prostitute in that Norwegian camp where Fatima and Aziz stay. CD: The double moon was a strong image. I have never seen one. Please could you say a little more about this. AM: I’m so glad you picked it out. I love it myself. It keeps appearing in my stories all time, often as a necessity. At some point, I just feel, now I have to have it. It’s actually one of the few images I borrowed from other writers, and recycled in my way. I stole it from Hugo Pratt, the Italian author of Corto Maltese. For me the twin moons are the hallmark of Pratt’s work, they symbolise a love of story telling, a love of life in the midst of…you know. CD: You are now doing a PhD in English in Stockholm. This seems a little unusual. Please would you say a little about this. What are you gaining mostly from the course. Is it helping your writing? AM: I actually finished in May. I defended my dissertation on a few postcolonial writers. I started in 2004, when I got a two-year grant from Wallenberg Foundation. Then I was employed by the Department of English to finish my project. I quite love writing about literature, doing what we usually don’t have time for, analysing stories in depth, taking time to discover important quirks of different writers. I wouldn’t say academic writing has helped my creative writing. The two processes are really quite different, quite antagonistic, but at the same time, doing both has its benefits. Writing creatively helps me detect academic bs. Research helps me understand and appreciate different things about narrative, things an author cannot plan but which language and narrative yield to readers despite everything. AM: I do have a vague memory of pouring salt on slugs, believing they’d melt, but they didn’t. Ah, actually one time, when I was 12-ish, rumour had it Italians were buying Bosnian snails, and that people were making big money collecting big juicy ones and selling them to retailers. I could only find small specimen but some boys found a few meaty ones and I bought them to resell, but then I got less money than I’d given. I’ve always been bad at business, no doubt. AM: I’ve had many. Or none. What I mean is that every once in a while I experience something that reveals something new about me, the way I react to things. I think my struggle with religion back in the 90s as well the birth of my first son. AM: I really can’t select any one thing. I’ve also changed during the war so that the sad things are less sad, if that makes sense. What I mean is that sad things can strike me hard but at the same time my sensitivity is somewhat dulled. AM: Sometimes I get too angry about small things. I’d rather not get angry at all. I also get angrier because I’m angry. I hate being angry. Madness. AM: To expose myself to someone and yet don’t get rejected. Also, to be able to be silent in company without awkwardness. AM: Kiss the boys. The little one doesn’t get up easily. It’s an entire ritual of waking up. He wants me to rub his shoulders and back, maybe kiss his soles. That does the trick.